Available in Tempered and Sharpened Versions! There is no soldier more dangerous than one fighting in the name of their faith. The Crusades pitted Christian knights against Muslim warriors, and both sides fought like men whose souls hung in the balance. 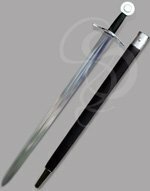 This Crusader sword is a historical replica of the arming swords used by Knights Templar in those holiest of wars. 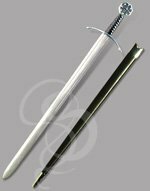 If this Crusader sword looks familiar then you were either a Templar knight in a past life, or you have seen our SBA-DOMINUSCRUSADER. The two swords are identical, except that this version does not have the double-fuller design of the DOMINUS. No fullers means a wide-open canvas for engraving--be it text, graphics, logos or decorative patterns. 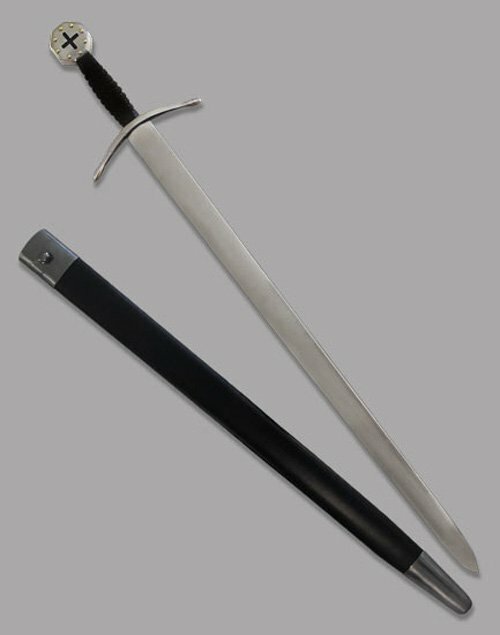 The Crusader (this sword) is hand-forged from high-carbon steel. It features a full tang and a satisfyingly padded leather grip. 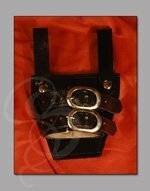 Add in the rugged steel guards and you have a powerful sword that is buit to last. But the true soul of this blade is in the pommel. It's similar to an Oakeshott Type I (for those who follow that sort of thing)and is deeply etched with the Christian cross under which the crusaders lived and died. Eight brass studs for a perimeter around the pommel, adding a touch of contrast and color. 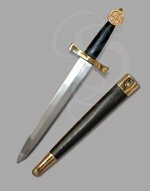 So, whether you want to show other that you are willing to fight for your faith, or you simply want to own a piece of history, then the Crusader Knight's Arming Sword is the way to go. And with the new, fuller-less blade, you are free to create an engraved masterpiece using our online engraving utility. I have bought engraved versions swords as presents for 3 weddings and will continue to do so. They look great and while I always tell my friends that I hope they never have to use them as weapons, these will definitely do some damage. I was looking for a sword to engrave with bible verses for my Son's wedding. We'd been adopting bible verses and writing them on a wooden sword at major life events since he was little. I was expecting a difficult and expensive process to find a real sword and engrave it. Roger at strongblade.com took a difficult job and made it enjoyable. With a lot of attention to detail and an eye toward making the treasure I'd always dreamed of for my Son he got 7 verses on the sword blade perfect. He made sure fonts, size, spacing, position on blade --- everything was perfect and then triple checked it to be sure it was right. This was a great company to work with and I'd gladly do business with them again. I don't write many reviews but the service was so outstanding I had to. I can't wait to present it to my Son and his soon-to-be wife. Thank you Strongblade - you exceeded my expectations.